On Monday, April 25, while sailing to Ajaccio, Corsica, Rhapsody of the Seas encountered inclement weather. Five stateroom windows on the third deck were broken, resulting in water incursion. Six rooms were damaged, and carpeting in some nearby hallways and staterooms on deck three was soaked by water. No serious injuries were reported. The windows were replaced and the ship resumed her itinerary. Because of the soaked flooring, which could not be immediately replaced without causing great inconvenience, 45 guests were relocated to other staterooms, and 44 departed the ship in Corsica. We have compensated all the affected guests with a full refund and future cruise certificate in the total amount of the cruise fare they paid for their sailing, as well as handling accommodations and travel costs for those who left the ship. A Royal Caribbean ship has been slightly damaged after a wave hit the vessel while sailing a Mediterranean cruise from Barcelona, Spain. The popular Cruise Law News blog is the first to report this and several passengers have gone to social media posting updates. 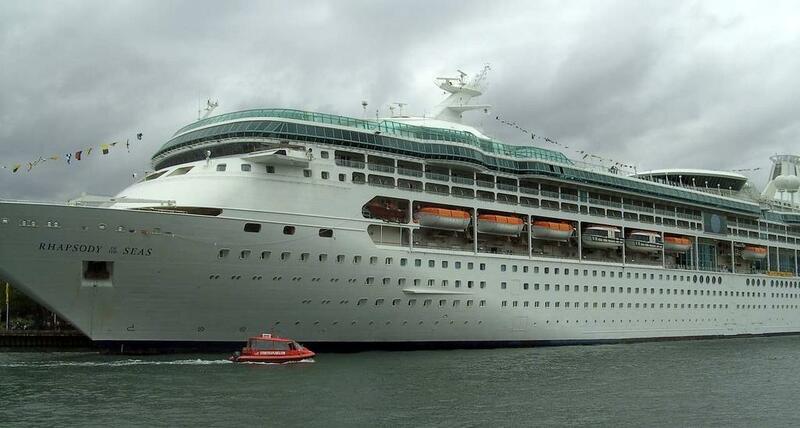 #royalcaribbean Rhapsody of the Seas had 60 rooms flooded last night en route to Corsica. 5 windows burst flooding floor. Rhapsody of the Seas which is a 78,500 gross ton ship was hit by a wave sometime after 4am as the ship was sailing towards Corsica. The wave smashed windows and slightly flooded 60 cabins on deck 3 which also spilled into the hallway. It’s not clear if there were any injuries but have contacted the cruise line to confirm this. I’m on Rhapsody of the Seas. Last night 4am wave hit ship and knocked out my window and 4 others on deck 3. lucky we weren’t swept out. (2) ceilings and walls collapsed. We were all bleeding and hallway was flooded. Royal Caribbean has not handled this well. (3) ship staying in Corsica till 12am to “fix it” This was only night 1 of 9 nights. Rhapsody of the Seas continued to its scheduled port of call at Corsica but is staying until 12am to fix the damage. The vessel is sailing a 9-night Mediterranean and Adriatic cruise and is scheduled to arrive in Naples, Italy on April 27. Waves do sometimes hit cruise ships with no warning and it also depends on the weather conditions. Cruise Hive has previously reported on cruise ships being hit by freak waves and waves from bad weather conditions.